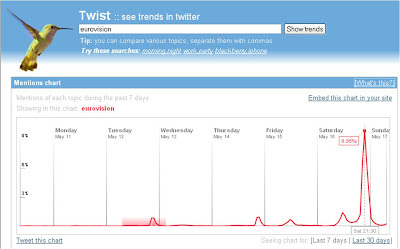 Eurovision and Twitter - #Eurovision the ultimate in social TV? Last night around 200 million people across Europe tuned in to the Eurovision Song Contest - but this year they tuned into Twitter too. Everyone has an opinion of Eurovision and last night Twitter was alive as people expressed them. 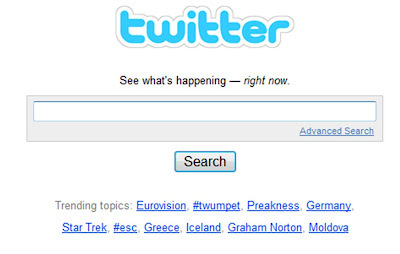 By the end of the Eurovision contest eight of the ten trending topics on Twitter were Eurovision related! The rich stream of Twitter commentary more compelling than the 'text in your thoughts' stream that the BBC had running on screen and Twitter updated far more frequently. We have seen events start to be socialised in real time through social media platforms with the CNN / Facebook integration around Obama being the best example of an official tie up to date. 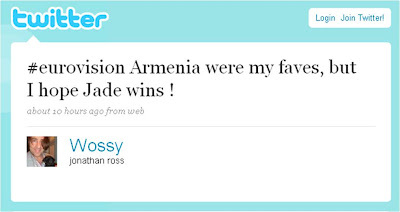 However, Eurovision did not promote a Twitter hashtag or encourage viewers to take to Twitter, the public worked this out for themselves. The Twitter noise around Eurovision shows that the that communities can self-organise and will use social tools, whether encouraged to or not. However, Eurovision dominated the trending topics on Twitter, and whilst the proportion of the 200m Eurovision audience who were Twittering was tiny, it does show the potential for TV broadcasts to become more interactive and engaging - social TV is arriving! Eurovision Predictor tool - Google gets it right!